Below is a mind map about how the government shutdown and some governmental approaches relate to our connected world and collaboration. It introduces the ProxThink growth model, a collaboration approach created for a connected world. It also shows you the best way to start playing around with and using the growth model (within the Quip mobile app or in your own low-tech and/or high-tech ways). The starting point of the mind map is the large blue bubble that says: Old-Fashioned? Shutdowns and Some Governmental Approaches Outdated? Antiquated? What Can We Do? It’s a work in progress. I hope to make it into a video. In the video, I’ll narrate and be zoomed in, panning around and opening bubbles and paths. However, I’ve added some numbers and notes for people (like you!) reading the map on their own. For the reading order, follow the numbers, notes and arrows. Begin at the large blue bubble below where it says 1. Start Here. Click the map to have it fill the window. Then you can zoom in and look around as needed. There is also a PDF version (for ultimate scaling) of the mind map, linked to below the graphic. Old-Fashioned? Shutdowns and Some Governmental Approaches Outdated? Antiquated? What Can We Do? This is now a monthly event! I may not post this here every month, but you can always find ProxThink-related events via the Upcoming Events menu item. Details for this one are below. Hope you’ll join us! The Shared Situation Guide is built on top of the ProxThink growth model. I’m psyched about this new way to deploy it! Help shared situations come alive. The modular version of the shared situation guide is now available! It’s easier to focus on each process. The processes are the Vadi Agreement, Proxri, ProxMonitors processes. In the original one-page version, those processes were sections of the document. But in the modular version, they become separate documents, making it easier to focus on each one. It makes getting around and navigating faster and easier. Just FYI, this modular version requires a little time to set up the section documents and navigation links. So if you’re new to the guide, you’ll get a sense of it faster with the original one-page version. You can check out and start using the modular version here. It’s also linked to from the original guide here (see the “modular version” link in the first bullet on the page). So far, it seems cleaner and easier to navigate! 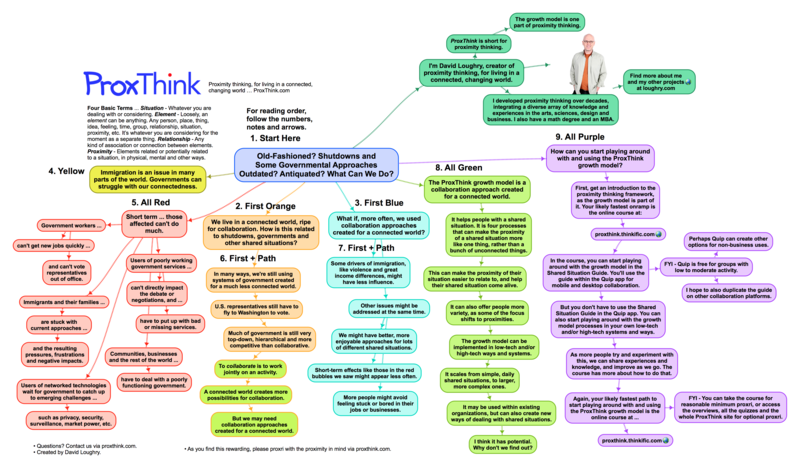 When I created the original shared situation guide, I challenged myself to create just one main document that a group could use to collaborate using the processes of the ProxThink growth model. However, the more I use it, the more I realize that a small set of documents might also work well. So I’m working on a modular version, where the main sections of the original version become separate documents. So far, I’m liking it and excited about it. I’ll let you know when it’s available to try out! As you may know, the Shared Situations Guide is built on top of the ProxThink growth model. I recently wrote a new piece for the Shared Situations blog: How Good Feelings Might Arise from Using the Shared Situation Guide. The Shared Situations site has links to begin using the guide, provides starter sets for some common situations, points to workshops for learning the guide, and helps people find and collaborate with others using the guide for shared situations. Check it out at sharedsituations.wordpress.com.